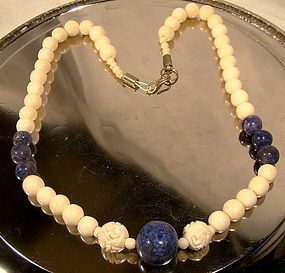 A vintage 1930s-50s strand necklace consisting of carved bone and blue Sodalite beads. The beads range from 3/16" to 5/8" across the largest Sodalite bead, and two bone beads are hand carved. This 22-3/8" necklace has been restrung and it has a brass hook and eye clasp. It is unsigned and it is in excellent condition with no chips, cracks, losses, damage or repairs. All items are thoroughly and conservatively graded and all condition issues are noted; all items are vintage or antique and may have slight signs of gentle use. Small packet air shipping to the U.S. starts at $9.50 (other spots may vary). Items paid with a credit card will be shipped to confirmed addresses only. We do ship internationally. All of our prices are in $US. PLEASE NOTE: We DO NOT accept PayPal, only VISA and MASTERCARD. 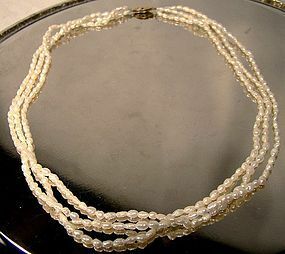 A fine and vintage 16-1/2" triple strand necklace of small ~3/16" long baroque pearls with a gilt sterling silver clasp. This necklace is in excellent condition with no chips, cracks, dents, bends, corrosion, losses, damage or repairs. All items are thoroughly and conservatively graded and all condition issues are noted; all items are vintage or antique and may have slight signs of gentle use. Small packet air shipping to the U.S. starts at $9.50 (other spots may vary). Items paid with a credit card will be shipped to confirmed addresses only. We do ship internationally. All of our prices are in $US. PLEASE NOTE: We DO NOT accept PayPal, only VISA and MASTERCARD. A fine Victorian period French jet (black glass) necklace c1885-1900. This necklace measures 58" long and it can be worn doubled if desired; it consists of faceted beads with faceted teardrop, lozenge and barrel shaped beads. It is 3/8" at its widest and each bead is individually hand knotted. This item is in very good condition with no cracks, losses, damage or repairs other than a 3/16" chip to one teardrop and some minor expected edge abrasions and fleabites to a few of the edges on some stones (all barely noticeable). All items are thoroughly and conservatively graded and all condition issues are noted; all items are vintage or antique and may have slight signs of gentle use. Surface shipping to the U.S. starts at $7 (other spots may vary) - insurance is included. Items paid with a credit card will be shipped to confirmed addresses only. We do ship internationally. All of our prices are in $US. PLEASE NOTE: we DO NOT accept PayPal, only VISA and MASTERCARD. A vintage 26-1/2" necklace consisting of individually knotted graduated round Chinese serpentine jade beads. 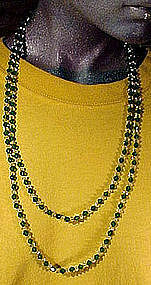 The beads range from 9/16 to 17/16" across, and this necklace features a gilt sterling silver box clasp (marked SILVER). This item is in excellent condition with no chips, cracks, dents, bends, corrosion, losses, damage or repairs. All items are thoroughly and conservatively graded and all condition issues are noted; all items are vintage or antique and may have slight signs of gentle use. Expedited tracked insured shipping to the U.S. starts at $22 (other spots may vary) - insurance/tracking is included with shipping quotes. Items paid with a credit card will be shipped to confirmed addresses only. We do ship internationally. All of our prices are in $US. PLEASE NOTE: We DO NOT ACCEPT PAYPAL, only VISA and MASTERCARD. A very long and versatile genuine cultured pearls necklace with a 14k yellow gold clasp and gold beads. This necklace can be worn long, doubled or even tripled as a choker; the 131 pearls range in size from 5-6.5 mm. and the seven 14k yellow gold beads range from 3.5-7 mm. The ornate clasp is stamped 14KT, and this strand is in excellent condition with no chips, cracks, dents, bends, corrosion, losses, damage or repairs. All items are thoroughly and conservatively graded and all condition issues are noted; all items are vintage or antique and may have slight signs of gentle use. Expedited tracked insured shipping to the U.S. starts at $31 (other spots may vary) insurance and tracking included in shipping quotes. Items paid with a credit card will be shipped to confirmed addresses only. We do ship internationally. All of our prices are in $US. PLEASE NOTE: We DO NOT accept PayPal, only VISA and MASTERCARD. A vintage mid-Victorian natural carved jet 16" necklace c1860-80. Jet is derived from ancient decaying wood under high pressure, and it was used as mourning jewellery at the time. 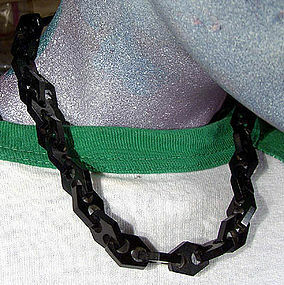 This necklace has twin-holed links measuring 9/16" wide. It has a hook and eye clasp, and this item is in excellent condition with no chips, cracks, losses, damage or repairs. All items are thoroughly and conservatively graded and all condition issues are noted; all items are vintage or antique and may have slight signs of gentle use. Surface tracked shipping to the U.S. starts at $18 (other spots may vary) - insured is higher, and mandatory on items over $95 if paid with a credit card. Items paid with a credit card will be shipped to confirmed addresses only. We do ship internationally. All of our prices are in $US. NOTE: we DO NOT accept PayPal, only VISA and MASTERCARD. An Art Deco molded coral glass pearls flapper necklace from the 1930s. This splendid vintage full length flapper necklace consists of molded coral glass beads, glass pearls, and gilt brass fittings. It measures an impressive 50" long and 5/16" wide, it has a springring catch, and it can be worn doubled or even tripled if desired. It is unsigned, and it is in excellent original condition with no chips, cracks, dents, bends, corrosion, losses, damage or repairs other than some original manufactured irregularities to some of the molded glass beads. All items are thoroughly and conservatively graded and all condition issues are noted; all items are vintage or antique and may have slight signs of gentle use. Expedited tracked and insured parcel shipping to the U.S. starts at $17 (other spots may vary, air is higher). Items paid with a credit card will be shipped to confirmed addresses only. We do ship internationally. All of our prices are in $US. PLEASE NOTE: We DO NOT accept PayPal. 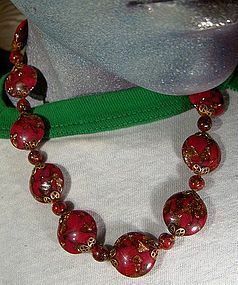 An Art Deco vintage gold filled and red crystal spider necklace circa 1930. This sautoir design necklace features a 1-1/4" width round spider with cherry red claw-set crystals suspended on a fine link 16" necklace with five red crystal rondel shape beads. The snap-over catch has a floral design and WBs. maker's initials, most likely for Ward Brothers of Birmingham, registered in 1888 - ?. It is in excellent condition with no chips, cracks, dents, bends, corrosion, losses, damage or repairs, but there is a claw a bit askew on the smaller crystal. All condition issues are noted; all items are vintage or antique and signs of use and patina should be expected. Tracked packet air post to the U.S. is $14 (other spots may vary) - insurance is included. Items paid with a credit card will be sent to the confirmed addresses only. All of our prices are in $US. PLEASE NOTE: we DO NOT accept PayPal. A 53-1/2" long vintage Art Deco green and clear facetted bead flapper necklace c1920s. This beauty features alternating 3/16" facetted emerald green and clear beads with a chrome-plated box clasp with a bezel set green rhinestone. The clasp is stamped MADE IN CZECHOSL. and it is in excellent original condition with no chips, cracks, dents, bends, corrosion, losses, damage or repairs other than some minor rubbing to the clasp's chrome plating. All items are thoroughly and conservatively graded and all condition issues are noted; all items are secondhand and may have slight signs of gentle use. Surface shipping to the continental U.S. starts at $6 (other spots may vary) - insured is higher, and mandatory on items over $85 if paid with a credit card. Items paid with a credit card will be shipped to confirmed addresses only. We do ship internationally. All of our prices are in $US. NOTE: we do not accept PayPal. 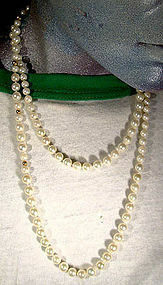 A 51" glass bead and faux pearl hippie necklace c1960s. This necklace features blue and teal glass beads with clear glass spacers, the widest of which measures 3/8" wide. 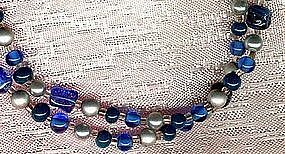 It has faux pearls and matte silver coloured beads as well. It is unsigned and it has a springring catch, and it is in excellent original condition with no chips, cracks, corrosion, losses, damage or repairs other than some very tiny scrapes to a few of the matte silver beads and some minor loss to the silverplating on the clasp. All items are thoroughly and conservatively graded and all condition issues are noted; all items are secondhand and may have slight signs of gentle use. Surface shipping to the continental U.S. is $5 (other spots may vary) - insured is higher, and mandatory on items over $85 if paid with a credit card; items paid with a credit card will be shipped to confirmed addresses only. We do ship internationally. All of our prices are in $US. A 20" strand of 6 mm. cultured pearls with a 14k yellow gold clasp. 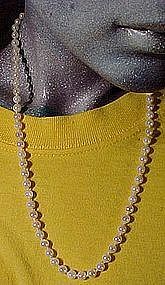 This necklace has 73 pearls with medium creamy white lustre; a few have very minor surface irregularities and one pearl has some minor peeling to the nacre. This strand is in excellent original condition with no cracks, corrosion, losses, damage or repairs. All items are thoroughly and conservatively graded and all condition issues are noted; all items are vintage or antique and may have slight signs of gentle use. Expedited tracked and insured parcel shipping to the U.S. starts at $21 (other spots may vary, air is higher). Items paid with a credit card will be shipped to confirmed addresses only. We do ship internationally. All of our prices are in $US. PLEASE NOTE: We DO NOT accept PayPal. An Art Deco graduated facetted rock crystal necklace c1920s. This 16" necklace has rock crystal beads measuring from 5/16" to 1/2"; the silver plated over brass slide clasp is stamped JAPAN. This item is in excellent original condition with no chips, cracks, corrosion, damage or repairs other than some loss to the clasp's silver plating. Surface shipping starts at $5 (to the US - other spots may vary) - insured is higher, and mandatory on items over $85 if paid with a credit card. We do ship internationally. All of our prices are in $US. 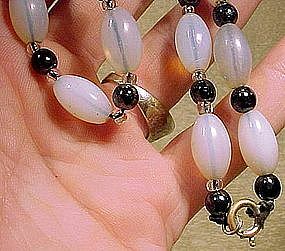 A late Victorian/Edwardian opalescent and black glass necklace c1900. This 17" strung necklace consists of oval opalescent glass beads with orange fire strung with round black glass beads and clear glass spacer beads. 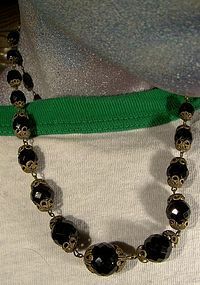 The black beads have an unusual metallic finish, and all beads are hand blown. It has been restrung (some time ago) and it has a silver plated springring catch (minor losses to plating). It is in excellent original condition with no chips, cracks, corrosion, losses, damage or repairs. Please note there are some tiny internal stress lines (NOT cracks) visible on some beads, not unusual on 19th century glass beads, and not damage. Surface shipping starts at $6 (to the US - other spots may vary) - insurance above $95 is mandatory if paid with a credit card. Expresspost-air post and Fedex are available for faster shipping options - please email with your zip code or postal code for the rates. We do ship internationally. All of our prices are in $US. PLEASE NOTE: We DO NOT accept Paypal.